But once a year what you read on your computer screen becomes reality for a weekend when travellers meet in Ripley to inspire each other and make new friends. The 2012 edition was the first Louise and I participated in and we excitedly packed our panniers on the Thursday night in view of a “nice” ride to Ripley along the scenic M1. 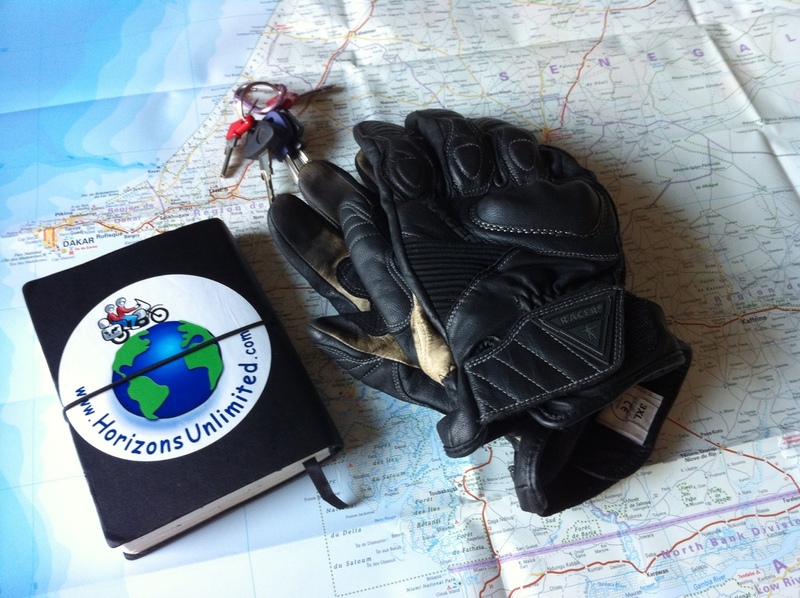 We were wound up because, in addition to the good times ahead, this would be our first day’s ride on our new motorcycles with most of the kit we will be taking to West Africa. A good opportunity to find out what works and what can be improved (see below). Our ride up was accompanied by an unusual appearance of the sun; you know, that big ball of fire we last saw in April…yes that… until we entered the village of Ripley where we felt the first drops of what would become a very wet weekend. We were greeted by the very welcoming team of volunteers and quickly made our way to the campsite to pitch our tent before the downpour and then headed to our first seminar. The programme for the weekend was excellent; the only regret was that there were so many sessions we wanted to attend but so little time to do them all. We did make the most of those we went to and I particularly enjoyed Dave Lomax’s session “Overweight is Under Prepared”. It is unbelievable how light Dave travels; the sum of his possessions (clothing, medical kit, toolkit, tent, etc etc) all fit into a Giant Loop bag which he throws on the back of his Suzuki DRZ…that’s probably the size of only one of my panniers! Dave takes things to the extreme (he’s the first to admit it), going as far as drilling holes into his toothbrush to save weight. But he is a great source of inspiration for all of us. I have to admit that I now make it a personal challenge to travel as light as possible. We all love gadgets and that’s usually the reason why we overload our bikes, but travelling light and a love for gadgets are not incompatible. I would argue the contrary actually; adding the “lightweight” factor in our search for cool farkles makes it more interesting to find a solution that is both lightweight and multipurpose. In preparation to the time we will spend in Morocco we attended Tim Cullis’ session. We are lucky enough to know Tim personally and he’s already given us his time to help us prepare our trip but his session was extremely interesting. Tim is a reference when it comes to riding in Morocco and I would suggest that anyone who likes adventure travel should read his website Morocco Knowledgebase. Morocco is unbelievably beautiful and welcoming and it also happens to be relatively close to the UK, so it is a big favourite. I have travelled through Morocco for 10 days in a Land Cruiser a few years ago but Tim’s presentation of all the different regions supported by pictures and videos proved there is so much more to see. Ripley 2012 was a great opportunity to meet old friends and make new ones. We caught up with Alex Jackson from Kaapstad Motorcyle Adventure tours. We first met Alex at the Adventure Travel Film Festival last year and within minutes we were looking at a map of South Africa and taking notes of all the routes to ride, places to stay at and t people to meet. There’s no doubt that our trip was made unforgettable thanks to his knowledge. Alex told us fascinating stories of his last trip including him spotting tracks of an elusive small wild cat on the Prince Albert Pass. Alex is a ranger and is training to get his field guide qualification (bushcraft) soon so that he can take his clients to the bush for some wildlife spotting after having guided them on the best motorcycle roads in the country. Talk about a complete package! We also met a great Dutch couple, Els and Merijn, who have travelled on two bikes through Africa and Asia. They had really entertaining stories to tell and were very inventive; they had a built their aluminium panniers themselves using “old” traffic signs and did a great job too; but they had a few insights to share, the best being that they had to dull their panniers because they were much too reflective! Els’ Transalp is something to be seen; she had it decorated by artists in Pakistan who covered it in a mosaic of tiny stickers to make it look like the decorated trucks of that country. We also had the pleasure to talk with the legendary Sam Manicom whose books I highly recommend and the incredibly funny Ed March who rides the world on his C90 and has the time of his life. Ed told a funny story of being handed an orange from a truck while riding in Iran, he explained how difficult it is to do but after seeing him riding while playing a synthesizer (!?) I’m confident he was up for the job! 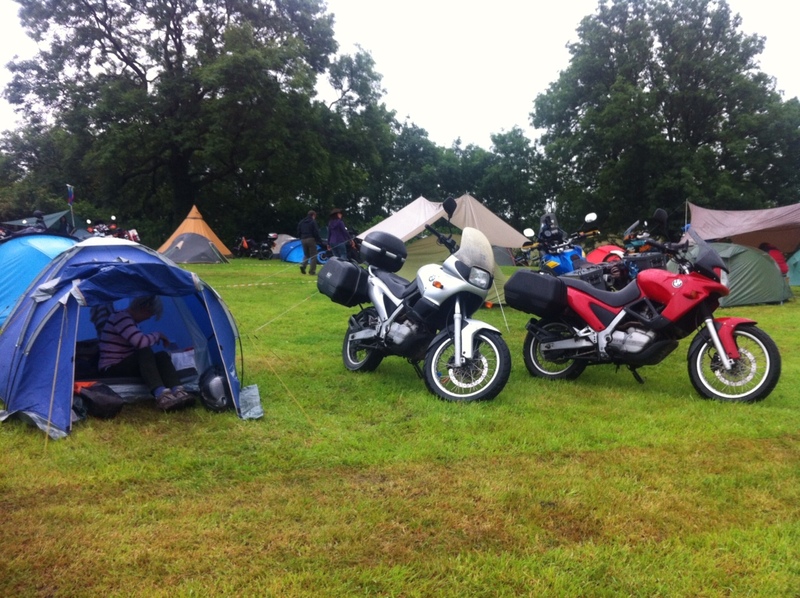 We had a great time in Ripley and the 2 months worth of rain that fell on us did nothing to dampen our spirits. We are looking forward to next year and feel even more eager to depart on our trip to Banjul. Thanks need to be given to the Horizons Unlimited community which we are very happy to be part of. See you on the road! – My bike handled terribly on the way up and I quickly realised that, unlike my Nomad 1600, the F650 is sensitive to how you load it. I rearranged my cases, putting the heavy gear at the front of the panniers so as to be close to the middle of the bike and that improved things. I also realised that I had to do something about the suspension, it was set very high (9cm taller in the back than Louise’s bike). So I dropped it by 4 centimetres and it handles much better. – Carry a mini bicycle pump. Dave Lomax’s tip; they’re small and light and if they can pump 100psi into your bicycle tyre, they can handle the 40psi of your motorcycle. Mine fits nicely under my seat. – A tea towel will do. Another tip from Dave; no need to carry a bulky towel to dry yourself; tea towels fold to nothing and will do the trick (to be confirmed). – It pays dividend to get a quality sleeping bag and a silk liner. Mine is a Blacks Ledge 400 and I’m very happy with it. It folds down very small and kept me (too) warm when the outside temperature was about 8 Celsius.